Beneath the vaulting ceiling of the Meat Market, Melbourne choreographer Lucy Guerin has created a darkly beautiful but ominous, shadowy world for her latest work The Dark Chorus. At the centre of the space is a wan circle of light. Around it darkness. A chorus, clad in elegant, black gowns suggesting times past, stalks the periphery of the illuminated circle, muttering darkly in a loud whisper about a curse, their horror at what’s happened, the fear they are being followed. Not all of what they say is intelligible but we get the gist, and the sense that this communal voice is persistent and powerful. Then from one of the black gowns a tiny dancer (Lilian Steiner) emerges in everyday white cotton shorts and T-shirt. Joined by a similarly clad Tyrone Robinson, they seem to be sizing each other up, testing themselves and each other. 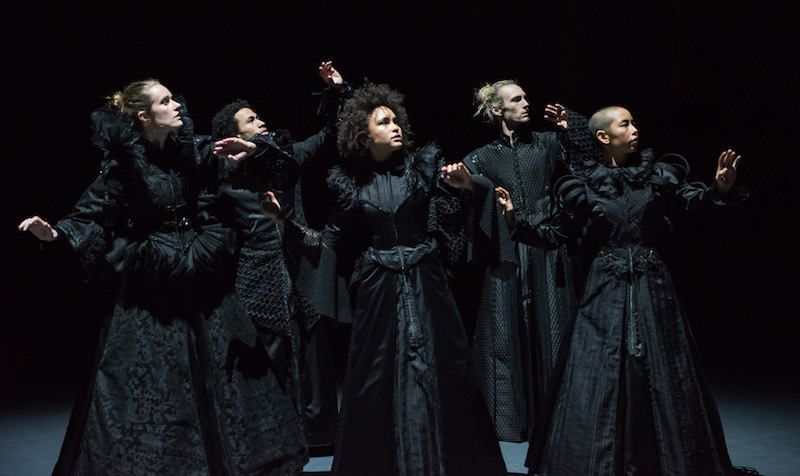 As the work unfolds, they, and the other three dancers – Jessie Oshodi, Stephanie Lake and Benjamin Hancock – appear from the dark chorus into the light of the circle and then disappear back into their black gowns. The movement of the chorus, with its elegant, courtly gestures, has a feeling of ritual about it, whether they are processing in stately fashion, running, scuttling or crawling. 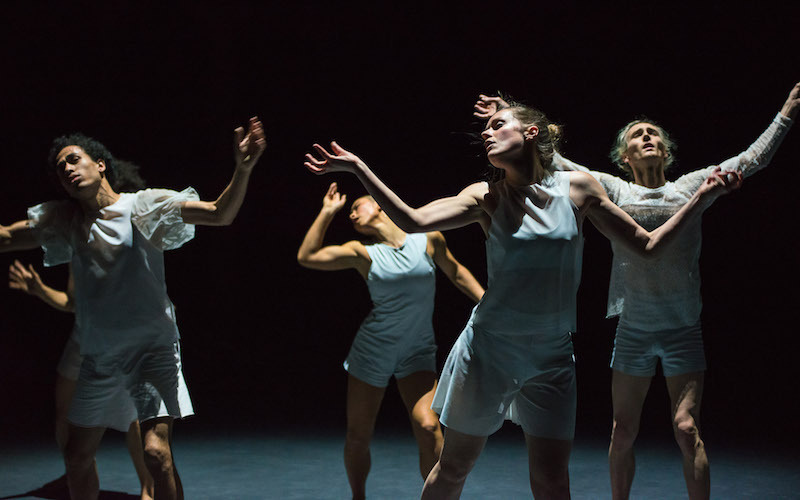 The five dancers in white move in a more contemporary fashion, stamping their feet, jumping, banging their bodies and punctuating their more frenetic movement with staccato bursts of breath. They are individuals, it seems, longing to escape and find a way to express themselves freely, while the chorus watches on – part traditional Greek chorus commenting on the action, but increasingly something more sinister. The exploration of binary tensions, which Guerin refers to in her programme note, creates a strong dynamic in the work: light and dark, inner and outer circle, individuality and mob rule, sound and silence, movement and stillness, past and present. The dancers themselves vocalise the concept early in the piece: “yes/no, in/out, up/down, tense/relax”, with Guerin echoing it in their choreography. Gradually the chorus becomes more controlling, shouting out instructions during a quasi-combative duet between Hancock and Robinson to take more risks with their movement. Eventually Hancock becomes the target and victim. Alone, isolated and vulnerable in the centre of the circle, he is manipulated and humiliated as the chorus who put him through a series of routines with a cardboard box. This section, I admit, began to wear a bit thin for me but the terrible denouement has a powerful impact. The Dark Chorus looks beautiful. The black costumes by Hancock and Harriet Oxley are gorgeous, while lighting designer Paul Lim uses chiaroscuro to create a visual world with a decidedly painterly quality. Robin Fox intensifies the unsettling atmosphere with a soundscape that begins with an ominous droning rumble and takes in video game-like beeps, faraway melodic singing and percussive beats as it builds to a fearsomely thunderous roar, then sudden silence. Audiences will doubtless read The Dark Chorus in different ways – but it has plenty in it to provoke thought and discussion. A glimpse into the complexities that can shape the peculiar connection between two living organisms.